Nov. 2013 Happy autumn everyone! As I’m typing this it’s 7 p.m. and dark out and the furnace is on. Looks like things are winding down quickly for this year. There are leaves galore to rake yet, and the garden needs to be put to bed. You’d think the squirrels would help while they’re rearranging all the walnuts in the yard. 2013 has been another great year for the Dunnville Horticultural Society. Our mandate is to “plant trees, create and maintain gardens and to educate the public on the topic of horticulture” and our goal is to “attract attention to our many gardens thereby drawing tourists and horticulturists alike to the town of Dunnville to admire their beauty.” Well, I’m sure I can safely say that we have achieved our goal. The town flowerbeds were absolutely stunning this year with their mix of perennials and colourful annuals. Our army of volunteers planted, weeded and cleaned up the beds. As the backbone of our society our volunteers are extremely important and greatly appreciated. Last year we logged over 1600 volunteer hours and this year I’m sure the finally tally will be much more. Our membership is thriving and we all know that membership is vital to the success of our society. Our membership fees will remain the same for 2014 and membership does have its advantages: we have members-only garden walks, bus trips, plant sales, seed exchanges, discounts at garden centres, Trillium awards, and guest speakers at our monthly meetings. What a bargain for only $10.00! The meetings are a nice social gathering as well as educational and I have met so many wonderful people since joining a few years ago. Looking back at 2013 we had a blast going to Canada Blooms by bus in March, had an outstanding presence at the Home and Garden show in April, and hosted the Spring Forum in April for District 9 which was a big hit. We did ourselves proud by providing excellent facilities, and lots of great food and prizes. I’m sure we left a lasting impression on the members of the visiting societies. This year was also a year of setting new records. Our plant sale in May turned out to be the highest earning in the history of the society ($1962.70). The garden walk at Rosa Flora in June had a record attendance of 50 members, ending off the night with a BBQ at the home of Rob & Lori Maracle. With Rob singing and cooking you couldn’t ask for a better evening. At the August general meeting we awarded our 2013 Trillium awards with 74 people in attendance which is also a record. Fifteen outstanding residential properties and 2 commercial properties received a 2013 Trillium garden stake and a bouquet of roses. With over 50 nominations these awards are quite prestigious. Pictures of the winning properties are on display at the Optimist Hall and can be seen on our website. You certainly can’t say we don’t get out much. Of course we still have November and December to get through. 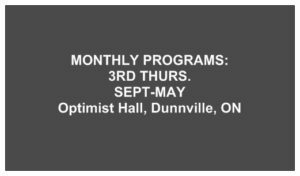 November’s general meeting is our annual general meeting (AGM) so we will review 2013 with a reading of last year’s AGM minutes and the treasurer’s report for the fiscal year which ends October 31st. This meeting is important also for elections and installations of directors and executive. If you have any interest in sitting on the board of directors please let it be known to any of the existing directors. We will also be holding our annual potluck dinner and Christmas celebration so please bring a little something to share and if we’re all very good boys and girls maybe Santa will make an appearance like he did last year! We will also be taking donations of non-perishable food items which will be donated to our local food bank. We usually have a seed exchange in the fall, so if you’d like to bring some seeds to share with your fellow members please do so, and please label them with descriptions, sun/shade needs, etc. And last but not least, we are having our annual photography contest so be sure to enter your favourite pictures. Last year’s prizes were awesome and I’m sure that this year’s will be too. Contact any of the executive if you are interested in entering the contest. There is still a bus trip scheduled for Tuesday, November 5th to the Royal Winter Fair. There’s so much going on at the fair so if you would like to go contact Debbie Thomas at 905-774-3064. We forged some new partnerships this year with a few organizations in town including the students of Dunnville Secondary School, Egger’s Truck & Machine and the Dunnville Rotary Club. The students of the high school’s construction class built and donated the arbour and Muskoka chairs that were raffled off at the Home and Garden show and they took orders at the plant sale to build some. (The students actually helped refurbish the floral clock last year, too. We also have 1-2 students helping out with kitchen duties, set up and clean up at our general meetings. This makes the work so much easier for the executive and helps the students earn their mandatory volunteer hours that they need to graduate. A definite win-win situation. Egger’s Truck & Machine came to our rescue this year to take care of watering the flowerbeds. The Dunnville Rotary Club is responsible for the area beneath Muddy the Mudcat so plans are in the works to team with them in 2014 to spruce up the area with some new plants and grasses. Many businesses and private individuals have come to our assistance with their generous donations of money, food, gift items and their time. A HUGE thank you goes out to everyone for your support and assistance in making the Dunnville Horticultural Society successful. Please remember: shop local! Dunnville’s businesses need your support as much as we need theirs. 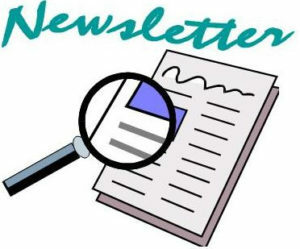 A complete list of our sponsors can be found on the website, and I have included a list with this newsletter. In keeping with the DHS’s original mandate, a burr oak tree was planted on October 3rd at the DHS memorial rock at Wingfield Park. The tree was paid for by a grant from the Ontario Horticultural Association. Tree planting was the DHS’s original mandate in 1929–you can read our current mandate along with a message from President Lori Maracle on our website. On a sad note, we lost former DHS presidents Peter Prosser (1989, 1990) on February 22nd and Jean Dickhout (1992,1993) on October 11th this year. They were both very much liked and respected by the executive and members of the DHS and will be sadly missed. Mr. Prosser (posthumously) and Ms. Dickhout were recipients of our 25 year membership award pins that were presented at the Spring Forum. This is the first time that we have awarded such pins. Janice Croft, Janine Jungas, Karen Waltham and Doris Thomson were also recipients. For a complete list of past presidents, secretaries and treasurers visit our website. Doris Thomson did extensive research and was able to trace everyone back to our founding president Mr. W. H. Wingfield (1929). There will be no general meeting in December so our next get-together will be Thursday, January 16, 2014 at the Optimist Hall. Your executive and directors for 2014 will be excited to get started so we’ll be holding two executive meetings in December in order to get a head start planning another stellar year. If you have any ideas for fundraisers, guest speakers or garden walks please let your executive know. Since this will be my last newsletter of 2013 I would like take this opportunity on behalf of the executive and directors of the Dunnville Horticultural Society to wish you and your loved ones a very Merry Christmas and a safe and Happy New Year. Shortly after 6:00 p.m. the DHS executive, directors, members and guests stood up and sang O Canada. Steve Elgersma said grace. Thank you Steve for your wonderful and powerful rendition. Dinner was served and dinner was outstanding. Thank you to everyone who provided food. Meeting was opened by Lori Maracle at 7:10 p.m. and she warmly welcomed everyone. She thanked Brenda Pittaway for hosting our cornhusk doll workshop given by Krista Barlow earlier this month and Debbie Thomas for all her hard work organizing the bus trip to the Royal Winter Fair. Sue Mazi put forth to have a motion made for the AGM minutes from November 2012 to be accepted as read. The minutes were not read aloud, but everyone was given a copy. Pauline Bradford made the motion and Vel LeVatte seconded. Motion was passed. Kim Christoff read highlights of the annual treasurer’s report and audit. Members Barb Whyte and Cindy Huitema had audited our financial records and found a few minor mistakes that were corrected. Kim pointed out some of our income: the Ways & Means table earned $484.00 this past year. Thanks to Betty Ballanger and Debbie Wilson for doing such a great job. The rent each month for the Optimist Hall is $50.00 so this basically pays for it. We have 129 members. We have received grants this year from OMAFRA ($1000.00) and Haldimand County ($4000.00). As our director of fundraising, Rob Maracle has brought in $4165.00 in cash donations (not including prizes and other donations). Kim read out a list of our sponsors, of which we have over 50. 17 of our sponsors gave cash, the rest donated prizes, flowers, and plants. Kim then explained the income and expense report. She went over our financial review. The treasurer’s report and audit was put forth for a motion to be accepted as read. Vel LeVatte made the motion, and Linda Muldoon seconded. Motion was passed. Barb Whyte and Cindy Huitema have graciously agreed to be our auditors again for 2014. Our operating budget for the upcoming year was read by Kim and explained. Lori asked members to fill out a short survey that was handed out with the agendas. She then spoke about the wonderful year we had. She gave us a sneak preview of her upcoming column in the Sachem which speaks about her pride of the DHS for being nominated for Community Project Award at Haldimand County’s 13th Annual Recognition Night. Even though we didn’t win, we certainly have made our group and our town citizens very proud. She also mentioned that anyone can volunteer—you don’t have to be on the executive to help out. Marvin Myhre, past director of District 9, swore in the DHS officers for 2014. They are as follows: President: Lori Maracle, Vice-president: Debbie Thomas, Secretary: Sue Mazi, Treasurer: Kim Christoff. Directors are: Betty Ballanger, Pauline Bradford, Maura Cooper, Mary Lou Johnston, Vel LeVatte, Rob Maracle, Marilyn Stavinga, and Ian Steel. After a short break, Lori read “A Redneck Christmas” and Santa Claus made an appearance. How wonderful of him to take time out of his busy schedule to visit us! Penny Sale winners were announced. The penny sale raised $230.00. Amazing work, ladies! The photo contest winners were announced: Winter: Gwen VanNatter, Spring: Marilyn Stavinga, Summer: Maura Cooper, and Fall: Donna Cavers. Gift certificates from Hauser’s Pharmacy and the Source were given as prizes. The poinsettia and Christmas cactus centrepieces were awarded and the meeting was adjourned at 8:40 p.m. Thank you to the Optimist Hall for providing our kitchen staff for the evening. Thank you to all who helped out.